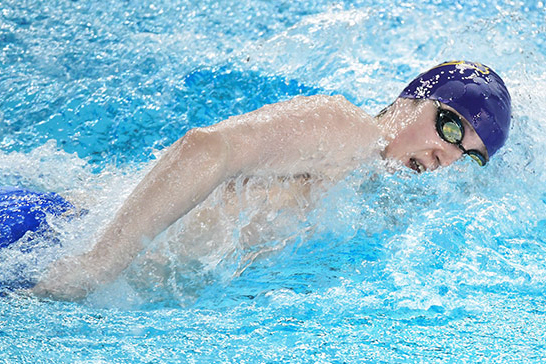 The Wilfrid Laurier University Golden Hawks swimming team were in action this past weekend at the deBray Divisional Championships in Sudbury, Ont. It was a magnificent weekend for the women as they finished in fifth place overall. It was the individual performances of Jasmine Raines and Jocelyn Chassie that propelled the Hawks to finish fifth as a team. Jasmine Raines put on a show for Laurier once again, as she captured three gold medals in the 50, 100 and 200-metre distance breaststroke competitions. Raines capped off her outstanding weekend by winning a bronze medal with Jocelyn Chassie in the 4×50 meter medley relay. The next swimming competition for the Hawks will take place in London, Ont. on Dec. 1 as they will compete in the Western Invitational. The tournament will be the last major swim competition for the Hawks before they head for the winter break. Chassie also impressed with two other individual bronze medals in the 50-metre freestyle and the 50-metre butterfly competitions. The men’s team recorded a sixth place finish overall at the championships. The Hawks were led by fourth year veteran Max Hughes, who picked up a bronze medal in the 400-metre individual medley. It has been a splendid start to the swimming season for the Hawks under new head coach Cathy Pardy. Pardy was announced as the head coach of the Golden Hawk swim program on Nov. 2, and this was her second competition in charge of the team. Pardy is familiar with the Laurier sports culture as she coached the Golden Hawk swimming team under former head coach and Golden Hawk Hall of Fame member Dean Boles. The Golden Hawk swimming teams are filled with talent and leadership. With big-time names like Jasmine Raines, Jocelyn Chassie and Max Hughes leading the way, fans can expect better finishes and an increasing amount of medals in the new year.